I read a very interesting article this week entitled Who Killed the Contemporary Christian Music Industry by Tyler Huckabee. Although I am not a huge fan of the Christian music industry (ironic – since I am a Contemporary Christian artist) I found this article to be very informative. I decided quote it (via link) as this week’s post. One of the areas I’ve branched out in lately is creating music instructional videos on You Tube. My channel is Learning Music With Ray; it contains videos on both music theory and music performance. One of the struggles I’ve run into is the question of whether or not it is legal to upload an instructional video teaching how to play current popular music. In my case, I am looking to teach the piano performance of Christian worship songs. However, this question can be applied to the teaching of any popular song of which the teacher does not own the copyright. You Tube has a video (You Tube Copyright School) that explains the details about copyright infringement when uploading You Tube videos. According to that explanation, the safest way to ensure avoiding copyright infringement is to include only original content in your videos. The law does allow for the fair use of copyrighted material under certain circumstances, but it is often difficult to determine if a specific example qualifies legally as fair use. I am not sure whether or not my demonstration of a popular worship song in a piano instructional video would be considered fair use. You may be thinking, “So why don’t you just make videos teaching how to play your original songs Ray?” That is what I have done so far. However, my songs are not exactly at the top of the Christian Contemporary charts right now. I’m sure people would be much more interested in learning to play the worship songs that are currently on the top of the Christian Contemporary charts. Teaching these songs would better fill the need of what people are looking to learn and would also probably result in more views. However, I don’t want to risk copyright infringement in order to achieve these things. This law feels kind of like the speed limit (one of those laws that hardly anyone follows. A search on You Tube will reveal millions of videos in which people are teaching how to perform songs that they don’t own the copyright of. However, the existence of these videos does not authenticate the legality of this practice. In some cases, the owner of copyrighted material will allow a You Tube video to stay up, but exercise his/her right to collect on the monetization of that video (as covered in my previous posts: You Tube Sync Licensing & You Tube Sync Licensing part 2). If you are looking to monetize your instructional videos, this process would prevent you from collecting on the monetization (the owner of the copyright on the song would collect) even though you created the instruction. It is unclear whether the many instructional videos currently uploaded to You Tube are suffering from this monetization issue, going undetected or just illegal. After calling Google and speaking to a customer service representative, I was told to write an email to their legal department. For those who are interested, the phone number I used to contact Google was (650) 253-0000. I got through to a customer service representative rather easily, but he was not able to directly answer my question (only refer me elsewhere). The email address he gave me for the legal department was legal@google.com. I will write an updated post as soon as I hear back from them. There are so many things that I know now as a performer, but I didn’t know back when I was younger. I wish I could go back in time with the knowledge that I have now. Unfortunately, that is not how things work. At least I get to pass my knowledge on to my students. I just had a really gratifying “pass on to your student” moment this week. One of my major downfalls as a young performer was my inability to be able to perform (when it counts) at my fullest potential. I had some amazing practice sessions while preparing for NYSSMA solos and other public performances. The actual performances would be ok, but they were never quite as good as those magical practice sessions. My mindset was all wrong, and I didn’t understand the impact that our mindset has on our performance. You see, I was focusing too much on not messing up. I remember watching the Winter Olympics as a child and seeing a top level figure skater fall in the middle of her big performance. I was shocked! Here was a person who practiced way more than I did, and in her big moment she blew it. From that moment on, I locked into a habit of focusing on “not falling” during a performance. At home, while I was practicing alone, I could relax and enjoy the music. However, on stage I was focused on all the difficult sections of the piece, and hoping that I would make it through them ok. You could imagine what kind of performance this mindset resulted in. My creativity and expression was trapped inside a mind of worry. I was getting through the piece instead of performing and expressing it. Now, thank goodness, I am no longer trapped by that terrible habit. I have learned to focus on all of those wonderful moments during my private practice. Those were the moments where the expression and passion of the piece were revealed to me. Those were the moments when I connected with the music. I string them all together in my mind, and edit them (the way one would edit a video) into a perfect performance. That is what I focus on while performing. I aim to recreate that perfect performance that I have edited together in my head. I realize that it may not all go perfectly, but if I don’t go for it, then there is no chance of it happening. I might as well shoot for the stars and see what I get. I had the privilege of explaining this concept to one of my band students the other week while helping her to prepare for her own NYSSMA solo. She had experienced her own magical moments while preparing her piece, and I didn’t want to see her experience the same disappointment that I had in the past. Thankfully, she understood what I was explaining and took it to heart. I just received her NYSSMA results today, and she received a perfect score. I may not have a time machine, but I can help others to save time. Moments like that make teaching a rewarding experience. Last week we discussed the basic idea of what sync licensing is and how it can be used through YouTube to earn money for songwriters. Remember, if you are creating your own YouTube videos, you can monetize them without having your songs entered into the YouTube Content Id system. However, if you want to collect from monetizing other people’s videos that contain your songs, you have to be registered in the Content Id system. Many musicians do not have the time to bother with these types of registrations and license monitoring. They would rather have someone else do this for them while they write, record and perform music. For these types of musicians, there are many options out there. As I mentioned last week, people who are already selling their music on Tunecore or CD Baby can also use these companies to handle their YouTube sync licensing. Each company’s website explains their pricing, options and policies for music sales (which are outside the realm of this topic), so I will let you research that on your own if you are trying to decide. If you are already with one of these companies (or another that provides sync licensing services) then it would probably be best to seek the services of the company you are with. I happen to sell my music through CD Baby, so I will share my personal insight about their sync licensing service with you. 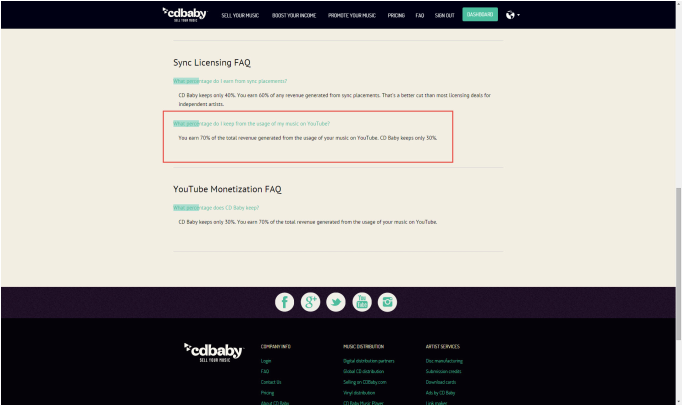 Here is a screen-shot of their FAQ page that explains the three options you have with sync licensing as a CD Baby artists. It clearly states that you can either allow them to collect all the licensing for you, have them “whitelist” your YouTube channel (so that you monetize those videos on your own) or opt-out of their YouTube monetization program. Notice how it says “Keep things simple and let us…” in the 1st option. This is because they want you to let them monetize all YouTube videos containing your songs (including your own YouTube videos). Why is that? Well, their FAQ page on the sync licensing states that they keep 30% of all revenue generated (and you get 70%). This is the going rate for YouTube sync licensing as seen in the statement highlighted by the red box in the figure below. For all other sync licensing (other than YouTube), they collect 40% (stated above the red box), but that is a discussion for another blog post. Other people may or may not use your songs on their YouTube videos, but you will most defiantly use them if you have a YouTube account. Do you think CD Baby wants to only collect 40% of the ad revenue on other people’s videos using your music, or on all videos using your music (including your videos)? That is why they push for this option. Some may think my use of the word “push” here is too extreme. Let me share my latest experience and allow you to decide. I contacted CD Baby about “whitelisting” two more of my YouTube channels on March 18th. First I called, and was told that I had to email them with an official request containing links of the channels I wanted to “whitelist.” Below is the email that I sent, along with their response and my response back. 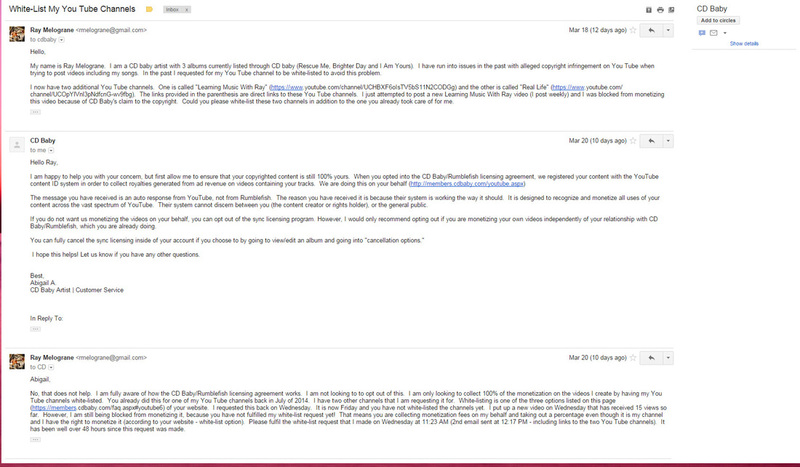 As you can see, the response took 2 days, and it did not answer my request. This agent tried to tell me that my only option was to let them collect for me or opt out. In my response back, I quoted their “whitelist” FAQ page (shown earlier) and the fact that it clearly lists three options. I never received a response to this email. I also called to try to work things out. The agent I spoke to apologized for the email I received. 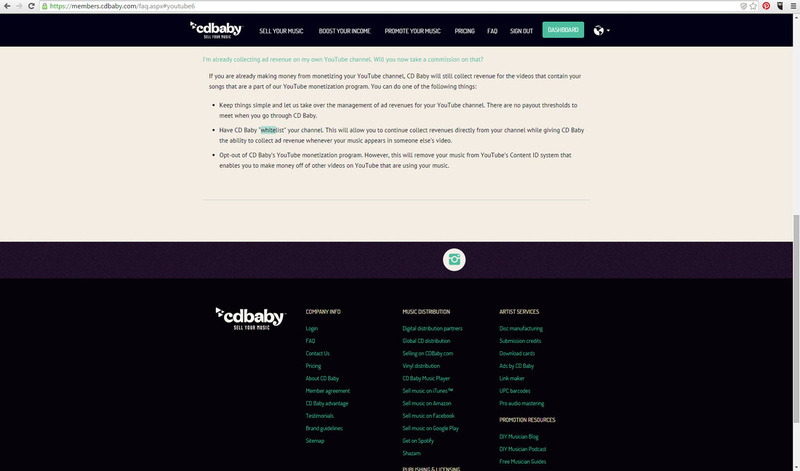 However, he explained that although the “whitelist” option does exist, CD Baby only offers that option sparingly. When I asked him to explain why it isn’t worded that way on their website, he changed his story and said that it is an option and they will process my request. However, he could not give me a timeline on how long it would take to “whitelist” my channels. Since they provide this service through a company called Rumblefish, he would have to put in a request to contact Rumblefish. After the correct CD Baby department receives and processes the request, Rumblefish would have to receive and process a request from them. I still have not heard back from them on the resolution of this. In the meantime, I filed a dispute through YouTube on the copyright claim that CD Baby had against one of my videos (yes, they were blocking me from monetizing my own video while I was waiting for them to whitelist my channel). The dispute was settled in my favor and the monetization block on the video was lifted. If you don’t want to go through all of this, there are two other options. Audiam is a company I mentioned last week that also offers sync licensing. They only retain a fee of 25% on the revenue generated by other people’s videos. They are very good about “whitelisting” your YouTube accounts, and do not try to collect anything from those videos. However, some of the other aspects of their agreement are a little more complicated. For example, you cannot opt-out at any time. The agreement you enter into with Audiam is a 1 year term that automatically renews. If you want to opt-out, you must contact them within the last 60 days of your term. Also, they have a minimum earnings requirement of $5 before you are paid, and payments are released within 45 days after the end of the calendar month. The other option is to fill out a YouTube Content Id application yourself at this web address (https://www.youtube.com/content_id_signup). Below is a screen-shot of the application page. In order to apply for this, you must won or control the exclusive online streaming rights for the content you submit. If YouTube accepts your application, then you will be able to directly collect monetization revenue on all videos using your songs (including other people’s videos). If you are ambitious and have the time to complete this process, it may be a beneficial option. The existence of You Tube has created a new way for songwriters to earn money from their music. Whenever a You Tube video is created that contains one of your songs somewhere in the audio content, you have the right to monetize the video and collect a portion of the advertisement revenue created. This is true for videos that you create on your You Tube channels and videos that other people create on their You Tube channels which include your music. For videos that you are creating on your You Tube channel, the process is fairly straight forward. You just need to set up your You Tube channel to be able to monetize your videos. 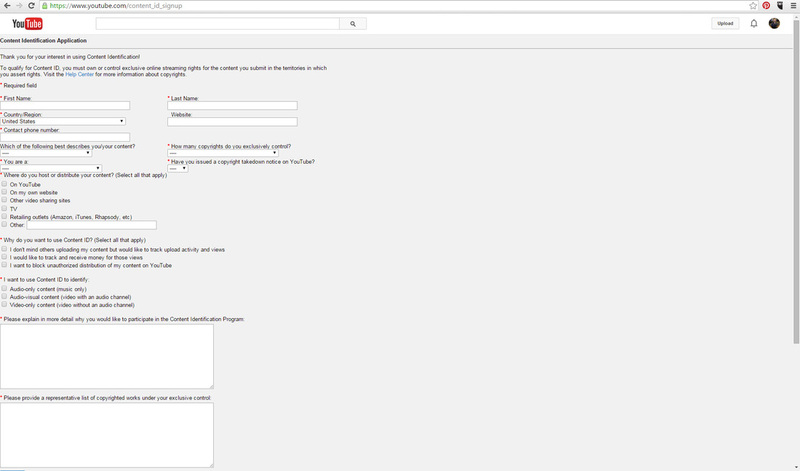 There are several features that can be unlocked in the Status and Features page under the Channel heading of your You Tube channel (Dashboard – Video Manager – Community – Channel – Analytics – Create). If you are a member in good standing, these features become available after different criteria are met (vary depending on desired feature). You must also open a Goggle Analytics account and connect it to you You Tube channel (fairly straightforward). Once everything is set you will be able to monetize any of the videos you create for your You Tube channel. This means you aren’t really getting any advantage out of including your original music because you already get to monetize the video (since it is your video and contains no 3rd party content). You Tube does report royalty information to artist royalty associations like ASCAP and BMI, but only after the video containing your song has had a significant number of views. The advantage comes from having your songs appear on other peoples videos. Even though the video was created and uploaded by someone else, the fact that it contains your copywritten song prevents this other person from being able to collect advertisement revenue. It also gives you the power to have the video taken down, have the song removed or monetize the video yourself. This third option allows you to collect advertisement revenue on another person’s video since it contains your song. In order to do this, your songs must be registered in the You Tube Content Id system. This is a software system that searches all of the content on You Tube for matches to your software. Companies like Tune Core and CD Baby have the ability to provide this service for you. They register all of your songs into You Tube’s Content Id system through their registration license. You Tube pays the ad revenue to them. They keep a percentage (for their services) and give the rest to you. Another company that provides this service is Audiam. This company provides only sync licensing whereas the other companies primary service is providing a way to sell your music. I don’t have any experience with Tune Core, so I cannot speak about the quality of their sync licensing service. I have had some experience with Audiam and even more experience with CD Baby. Next week I will discuss more details about sync licensing through these companies. I will also discuss the possibility of handling your own sync licensing independent of these companies. It seems like the ups and downs of life are connected in some way. I've noticed that when I am less disciplined with my diet and exercise I also become less disciplined in my practice and recording routine. I get into this lazy slump that affects everything else. I don't feel motivated to do anything. Then, I push myself to eat better and exercise. Those first few days are an adjustment, but eventually my whole mood changes. I have more energy, and I feel motivated to accomplish things. I enjoy practicing, reading, recording and accomplishing things. So, what causes me to lose that pep in my step and go back into the lazy slump? How can I stay on track and stay motivated. Everyone is searching for the answers to those questions. For me, the answer seems to be keeping diligent in my personal devotion time with God. When I allow that time to suffer, I find that the other areas of my life are more susceptible to the downward cycle. When I diligently pursue private time with God, motivation and self-discipline become more accessible. You'd think that I would remember this point and never allow my private time to suffer. Unfortunately, I'm human and very forgetful. That's why I need the support of friends and family who are like-minded. My wife and I have been meeting once a week with another couple over the last six months, and it has revolutionized our Christian walk. We worship, pray and study the Word together. We call each other through the week and support each other through the hard times. I haven't felt this alive in quite some time. Thank you God for the joy of knowing You, and for the friends that you have blessed me with.